It just doesn’t get any better…our incredibly coddled lemon tree has ripening fruit! It never fails to amaze; the way you can feel so incredibly ill one day and, 24 hours later, the world is a beautiful place. The Milk Maid fair jumped at the chance to chaperone Farm Girl to the Kingdom of Nova, especially as she had announced she was in the mood for walking. And the route she chose was along the river. 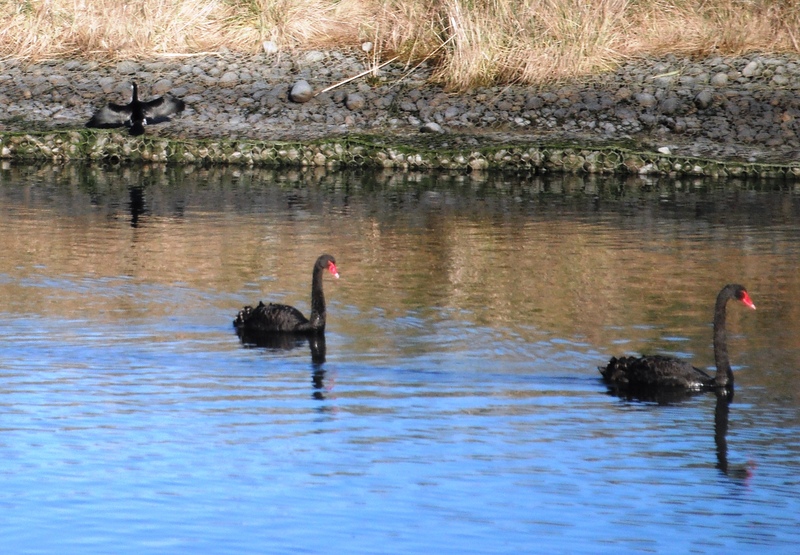 With the increase in wetlands as a result of the ‘quakes, we are seeing many more birds. Some birds we already know. For those we don’t, we either accost a passerby who looks ornithologically knowledgeable or settle for consulting Mr Google. 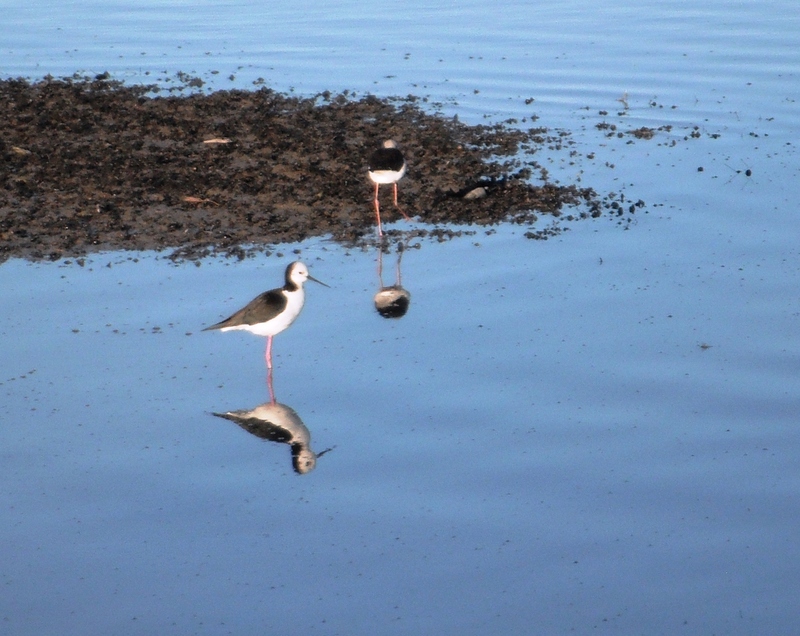 With that in mind, we think these may be Pied Stilts – dapper! The place was jam-packed full of birds of all shapes and sizes, resulting in a great many photos too terrible to share with such a cognisant audience, but the Homestead superstar of the bird world, our absolute favourite, is the pukeko. 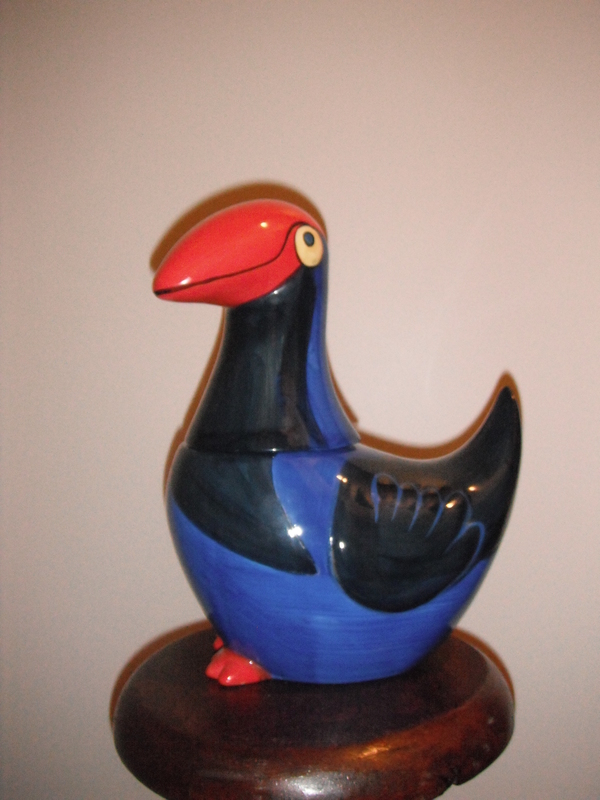 We’re not entirely sure why this swamp hen enthrals us so. Possibly it’s the way they happily make themselves at home where ever they are (unlike many of our native birds who take bashful to extremes) or maybe it’s that awesome colour combination. Red, blue, black with a hint of white, you can’t beat it! 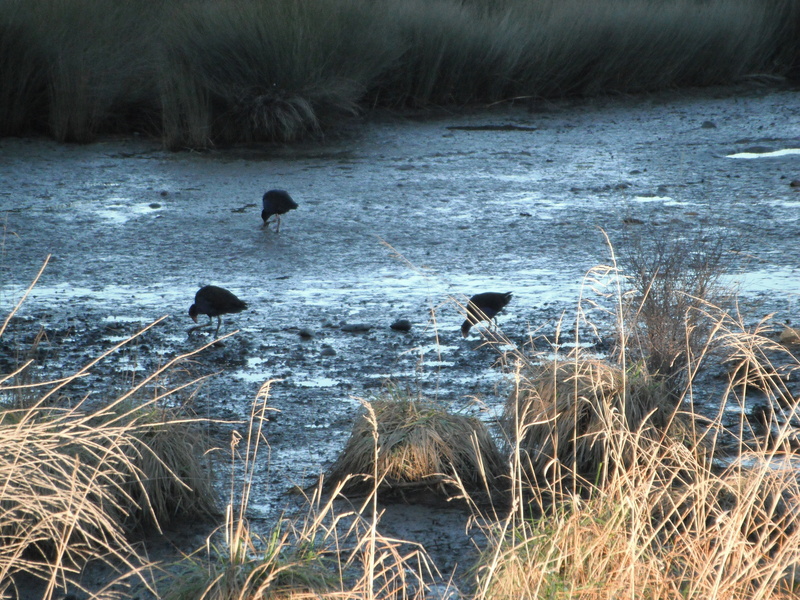 Our previous Homestead did not had such ready access to popular pukeko habitats and so spotting them going was always a bit special. One day, at The Goat Herd and Renovator’s weekly music lesson, situated on the outskirts of the gentile city of Tauranga, a pukeko was spotted staggering through the music teacher park like garden, it’s ungainly gait due to the orange it had tucked between bill and breast. Our exclamations at its deftness were not echoed by their tutor, however. At the time we were horrified, but now we wonder; if one were to have a go at our beloved lemon tree we could possibly be tempted. 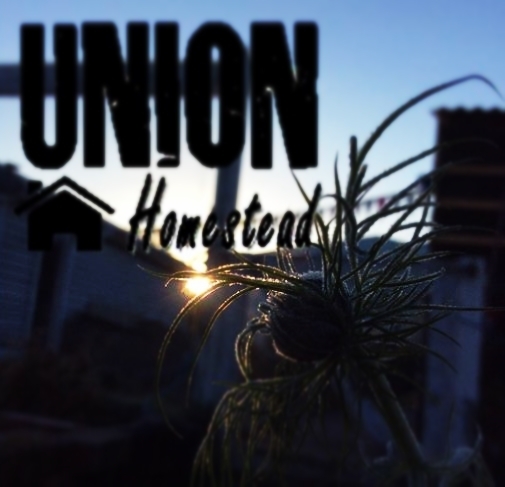 This entry was posted in Union Homestead and tagged a day in the life, Aotearoa, Avon River, birds, estuary, native birds, New Brighton, New Zealand, ornithology, Otautahi, Pied Stilts, Pukeko, river, wading birds. Bookmark the permalink. Sorry about the lurgy but gl;ad it is now over. Congratulations on the lemons, what a thrill for you all. Kudos for the ripening lemons but don’t shoot the pukeko. You have an amazing variety of birds in NZ, all shapes and sizes, we were blown away last year. We saw keas up on the hill above Queenstown, doing their best to tear apart a length of chain, and if ingenuity was all that was required, they would have succeeded – the teamwork of the effort was surprising, given how independently most birds seem to operate. We saw pukekos too – in fact, I’ve got far too many of pictures of them, because I always seemed to catch just their backsides in the shot – they’d turn, just as clicked. 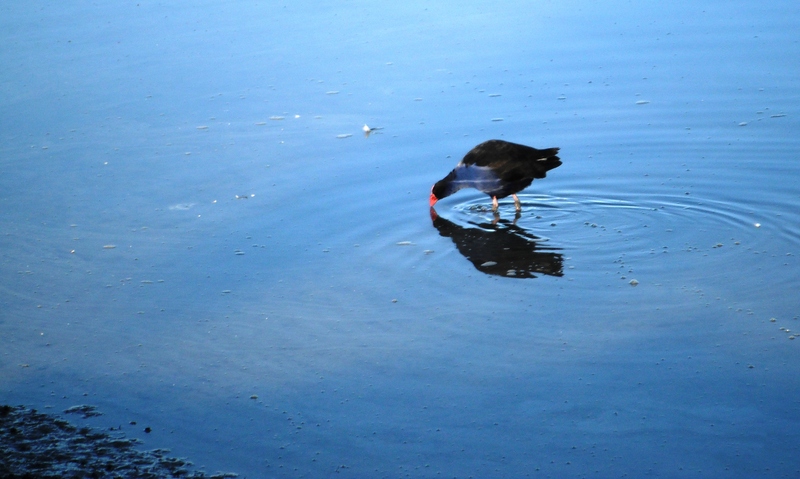 I don’t have the right sort of patience for bird photography, unlike you, apparently, since that shot of the pukeko in the water is beautiful. I feel like the music teacher in regards to deer – like everyone, I am susceptible to the Bambi-like cuteness of their big eyes and graceful movements. Until I have evidence that they’ve eaten the tops off ALL of my pea plants. My neighbour, Bryce has had his lentil crop (about 5 acres on 3 different fields) destroyed by deer this year. Like your music teacher with the orange stealing pukekos, It’s surprisingly easy to think of venison in these circumstances. But, hunting them is not allowed in our area (too many people about), so instead they just have committee meetings about the problem. Firstly, that final pukeko shot was an utter fluke; right place, right time, point and shoot and (as I had left my glasses behind) the pointing was incredibly vague. Thought of you as we were ambling along the river as there was not one Canadian Goose to be seen among the throng. Now if I were a good, patient photographer I would have persevered with the bellbird, fantail, white faced heron and the family of papango (native duck). I would be right with you re: deer to venison. Yes, they are beautiful (although I HATED the whole Bambi thing…waaaay to sad for a tenderhearted wee thing like me and being the eldest in the family, it was not right to cry at it. Ha! I have left that far behind and have spent the last two evenings sobbing my way through Billy Elliot with Farm Girl. 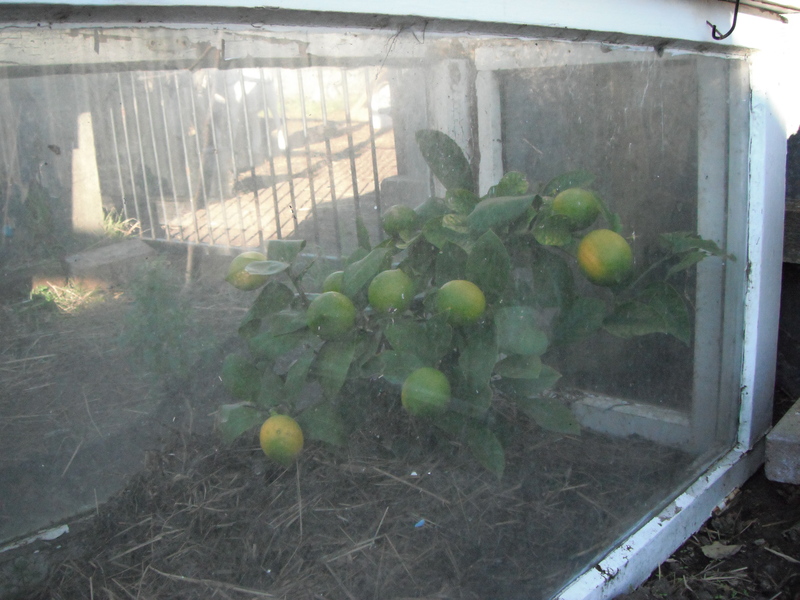 As for coddling the lemon, I know that there is light at the end of the tunnel as, once it is established, it should be able to fend for itself as plenty do around here with little or no attention and ours certainly did in Rotorua where it was in a less sunning spot and was often subjected to frosts. Committee meetings…ugh, you can keep them!! Billy Elliot!! Love that movie. Cried my way through it with number one girl years ago, and I don’t think I ever showed it to number two. I better get on that. Canada Geese. Grrrr. I know you already know my feelings on this, why did you even dare to mention them? :). Isn’t it funny how the best shots are often just fluke? And the ones you set up so carefully end up blurry or someone moves, or there’s a pole coming out of someone’s head.